one of the leaders in Hydrogen Research and the publication of literature regarding energy. A 2KW Portable Electrical Generator Powered by Pressurized Hydrogen. not coming soon, not under development. AVAILABLE TODAY. The Generator you can ORDER NOW is about 2KWs in output. 120VAC or 220VAC. It comes as you see it with a control panel that has ON/OFF and idle settings and control as well as throttle control. 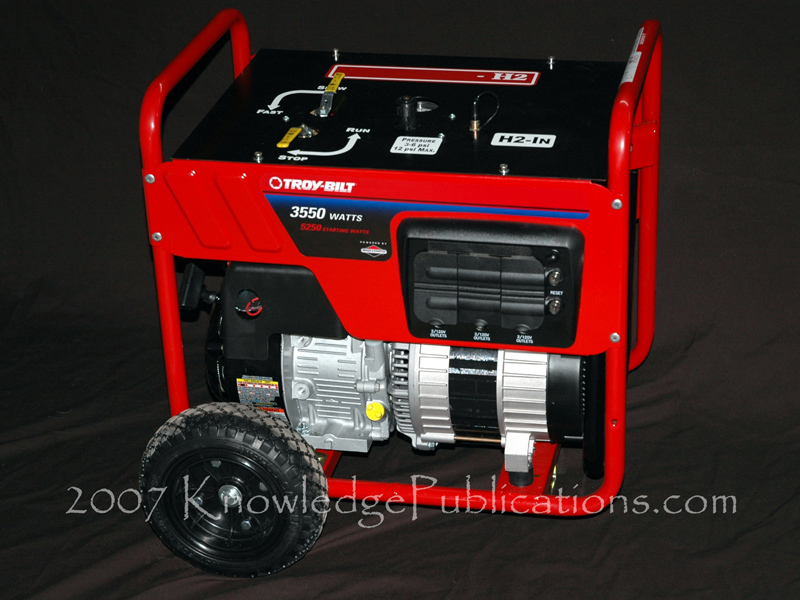 The generator comes with a hose and a hydrogen regulator that will work on a standard hydrogen cylinder at 3000psi. You supply the cylinder and the hydrogen. If this breaks, ANY small engine mechanic can fix it! That is NOT true with a fuel cell. for service of around 1000 hours or more. Shipping is Extra and will be quoted and charged. Shipping Insurance on the package is mandatory and will be charged. By buying now you are paying a $240 deposit (10%) on the unit. The remainder plus shipping and insurance is due before the shipment of the generator. You must sign and fax a receipt of purchase for the amount and a sheet that confirms that you understand that this an Electrical Generator which is Powered by Hydrogen. It does NOT create hydrogen, it does not run on water. It is not magical and there is nothing else implied. It is a 4 cycle internal combustion engine generator that is powered by Hydrogen. Nothing more. If you are interested in a hydrogen engine and want to fill out the survey so we know what you want and can contact you easier then click here If you want to purchase one of these generators now, then please use the BUY NOW link above. -The above engines in multi-fuel ability with Hydrogen boosting. -A biomass powered hydrogen dominant gas generator for fueling the generator.